Bertie by Jane Ridley – Elaine wrote a wonderful review of this in early December, loving it so much that she named it her Book of the Year for 2012. I am always interested to read more about Queen Victoria and her children. 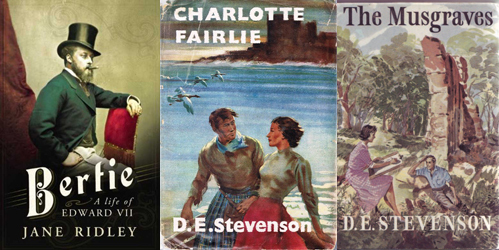 Charlotte Fairlie and The Musgraves by D.E. Stevenson – I am in desperate need of some DES! I have been sick with a cold this week and am finding it difficult to focus on some of my other books; these should be perfect. A Week in Winter by Maeve Binchy – Binchy’s final book. 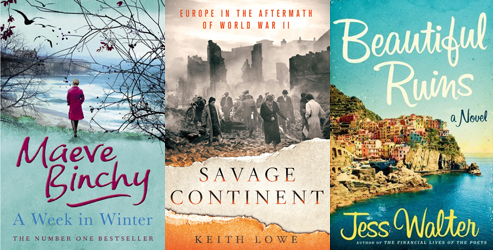 Savage Continent by Keith Lowe – like Orderly and Humane, which I picked up last week, this focuses on the problems and violence in continental Europe following the end of the Second World War. Beautiful Ruins by Jess Walter – This, “the story of an almost-love affair that begins on the Italian coast in 1962 . . . and is rekindled in Hollywood fifty years later”, got great reviews last year and sounds fun. 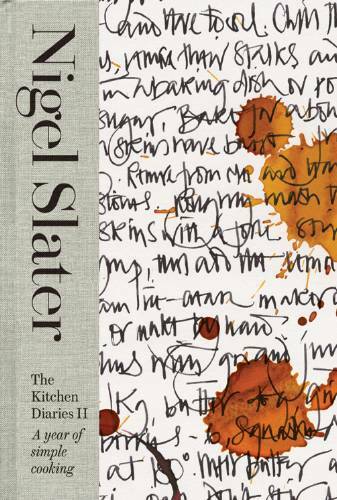 The Kitchen Diaries II by Nigel Slater – I have been curling up with this before bed each night and am slowing working my way through it. As always, Slater’s writing is even more delicious than his recipes. Looks like you have a great selection. That Nigel Slater book looks great! It is great! Not only is it beautifully written but the layout and photography are also perfect. As usual glorious reads here and I know exactly what you mean about the Slater book. Its like watching Nigella. Hang what the food is, the way she presents it is half the attraction! It’s true! And after Nigel, Nigella is my favourite food writer. I was just rereading How to Eat last week, from her pre-television days, and was reminded of what a wonderful book it is. I’ve been reading, and almost finished, Almost French by Sarah Turnbull. Non-fiction, it is as entertaining and informative as fiction. Absolutely loved it! And on their way to me via Amazon, Elizabeth Jane Howard’s early novel, The Long View, and Amanda Brookfield’s latest, The Love Child. Two writers from whom you can almost guarantee a great read. I loved Almost French too, Margaret! It has been a few years since I read it but I remember it very fondly. Gateway by Frederik Pohl (SciFi for SciFi Masterworks read-along at Gav Reads). I don’t think I have ever had a more mixed library haul. I haven’t heard of most of these but I did read the first few volumes of The Walking Dead a few years ago, before the TV show aired. They were pushed on me by a friend but I still can’t see the appeal of zombies. Enjoy! The zombies don’t interest me. They are just the reason for the conflict and therefore the plot. It is the relationships of the people thrown together that I enjoy. I love apocalyptic stories for this reason. Although some of the characters already are in relationship, the majority are not and have to either band together to fight the evil/adapt to present circumstances or face probable death. Ooo! I love it! BTW I will NOT be trying the graphic novels that started the whole thing-I just do not like graphic novels. I thought that I would give the regular novels a try. So far, Alas Babylon is my favorite apocalyptic novel written way back in 1959. I have the feeling these will not be living up to the level of that one. Another rich and varied “loot”, Claire. I mostly took back, but, have at my elbow “The Language of Flowers”, which we are reading for our January book discussion, and Hillenbrand’s “Unbroken”. Those sound like two interesting books, Penny! I have Bertie out, too! Also discovered on Random Jottings. My Queen Victoria groupie-ness can easily extend to her son. For me, so much of the appeal of Queen Victoria is her relationships with her family members so Bertie should be perfect for me! Beautiful Ruins keeps catching my eye. Perhaps I’ll pick it up one of these days. I need to start reading Maeve Binchy’s books. Great loot. It does sound fun, doesn’t it? And Binchy is wonderful so I do hope you start on her books one day! Nice selection. You’re right, DES is perfect for reading while laid up with a cold. Charlotte Fairlie is on my list of preferred DES books, while the Musgraves hovers much lower down. I find the whole family somewhat uninspiring, myself, but there are a number of other enjoyable Dessian characters. Especially the Bloggses. I have to say, I am not expecting much from The Musgraves, having heard lacklustre things about it already, but I am excited about Charlotte Fairlie! I used to absolutely love Maeve Binchy, but somehow I seem to have forgotten all about her until I saw your post! I think I may go to my library and see what I can find by her that I haven’t read yet, especially A Week in Winter. I still have some of Binchy’s early books left to discover so, as hard as it is to know that there will never be another new book, I do have those to look forward to. And many, many rereadings! These all look really good! I’m esp. interested in your take on Bertie. Elaine doesn’t usually “miss,” but I’d like to get at least one more opinion before I invest. 🙂 I picked up A Passage to India this week – I’ve never read it, or seen the movie, but it has been on my TBR shelf for several years. Elaine never misses with non-fiction! Our fiction tastes don’t always align but when it comes to histories and biographies her taste is flawless, so obviously I am expecting great things from this. I hope you enjoy A Passage to India! Volume two is just as good as volume one, promise! I don’t own either yet but that is going to have to change. I hope you enjoy Charlotte Fairlie – I’ve just read it for the third time (also convalescing!) I do envy you your library, not only stocking DES but such lovely old editions! I have to admit these two DES books aren’t from my library and had to be brought it from elsewhere in the province via inter-library loan. But they are lovely old copies and in surprisingly good condition! Oh, Kitchen Diaries part II! I loved part I. Part II is just as good as Part I. Having now read both, I think I am going to have to break down and buy them because they are just so wonderful to read and so inspiring when it comes to meal planning! Can’t wait to read your review of Savage Continent! Hi there, I’m Elizabeth and I think I’m your newest follower. I was so excited to see Charlotte Fairlie on your to-be-read list. I just listened to it on audio and I loved it!! I discovered DE Stevenson last year with Miss Buncle’s Book and she is now one of my favorites!! Welcome, Elizabeth! Glad to hear from another D.E.S. fan.